Scott Ramon Seguro Mescudi (born January 30, 1984 in Shaker Heights, Ohio), better known by his stage name Kid Cudi, is a Grammy award nominated American rapper and singer who first gained attention after the release of his debut mixtape a KiD named CuDi which he released in collaboration with New York street wear brand 10.Deep. 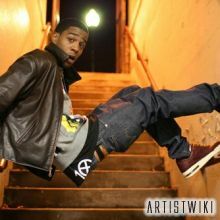 The mixtape caught the attention of Kanye West, which in turn led to Cudi’s signing to the G.O.O.D. Music Label. His debut album, Man on the Moon: The End of Day, was released September 15, 2009. In 2010 he has plans to release his second studio album titled Cudder: The Revolution of Evolution, a collaboration album with Chip tha Ripper titled The Almighty GloryUS and one with Ratatat.